We've just updated our list of best horror games in time for Halloween, which is handy if you're looking for spooks today. Sometimes, though, the scariest moments in games don't come from the horror genre, emerging from much stranger places instead. Below, you'll find a rundown of the games we didn't expect to find scary, but did anyway, because we are so very afraid. 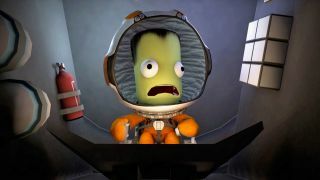 Expect a mix of existential dread, dolphins, truck driving, vampirism, and lost Kerbals. When I was a kid, my parents took me to a local game shop where you could try the second-hand games before buying. I gave Altered Beast a go, and my dad said it was too adult for me, so I had to pick something else. What could be terrifying about a kiddie dolphin game, though? I played for two minutes and it seemed fine. When I was a kid, my parents took me to a local game shop where you could try the pre-owned games before buying. I gave Altered Beast a go, and my dad said it was too adult for me (I was eight or nine), so I had to pick something else. What could be terrifying about a kiddie dolphin game, though? I played for two minutes and it seemed fine. Ordinarily, the only thing that's scary about Final Fantasy games is the occasional nightmare laughing scene. In Final Fantasy 8's secret Deep Sea Research Center, though, the game attempts to go for more of a mysterious horror vibe. You go deeper and deeper into this abandoned facility, and it culminates in a fight first with the dragon Bahamut, then with Ultima Weapon, one of the hardest bosses in the game (it's still not that tough to kill, though, admittedly). Check out the opening minute above. It's some spooky, 2001-style weirdness. Wes was spooked by becoming a vampire, but is anything scarier than the faces in Obivion? Being attacked by these things at night is Not Good.